This was a highly anticipated part of our China adventure for Dave & Sam. 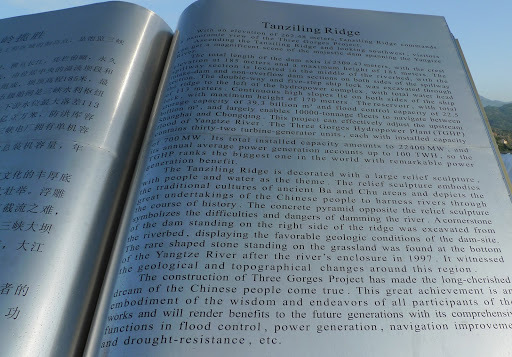 When I first floated the concept to Dave about traveling to China, he said OK, as long as we could include a visit to the 3 Gorges Dam. 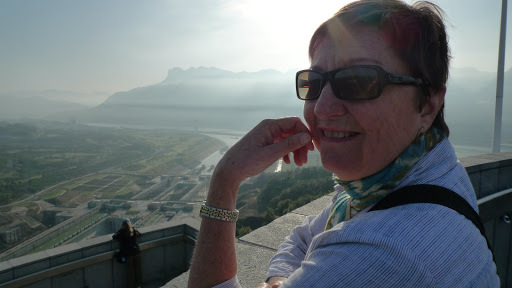 Well, I had no idea of any dams in China (only tea) so of course I readily agreed. 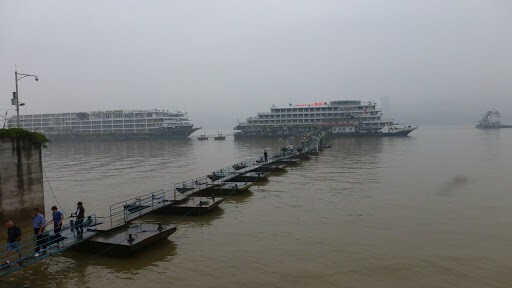 Now after a bitter-sweet 3 day Yangtze River cruise we finally reached the pinnacle of Chinese engineering. And I am glad we did this. 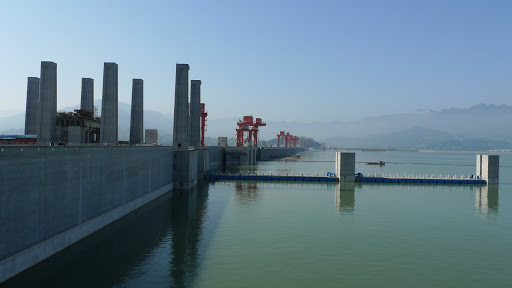 Much has been said and written about the forced displacement of millions of Chinese citizens for the construction of the dam, and it has been absolutely tragic for so many families, not to mention the environmental impacts. You can check out this link if you want. 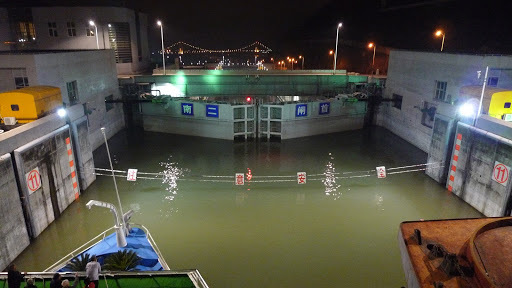 Nonetheless they reckon that this will protect China from the severe loss and damage from massive flooding of the Yangtze that’s occurred over hundreds of years. 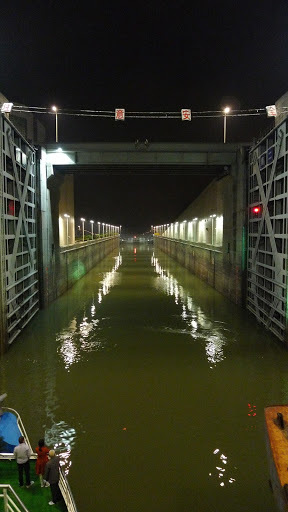 There’s not much I can say about our traverse through the locks to the other side of the dam, because I chose to sleep through it all. I managed to pick up a respiratory problem from the smog. At midnight Dave left the comfort and warmth of our cabin whilst I just opened my eyes, looked out through our balcony doors and acknowledged that a lock wall existed less than a meter away. Back to sleep, though I do recall lots of really loud scraping and crunching noises. 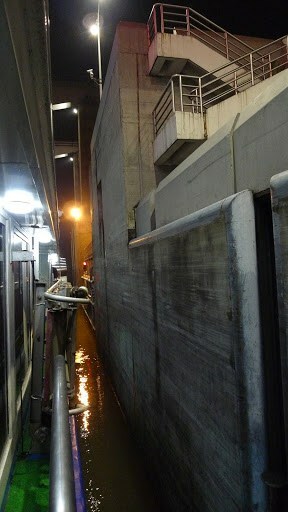 For anyone who cares about structures and big things, here are photos of our ship (and others) going through the locks. And if you’re really keen, have a look at this article, it has all the guff. 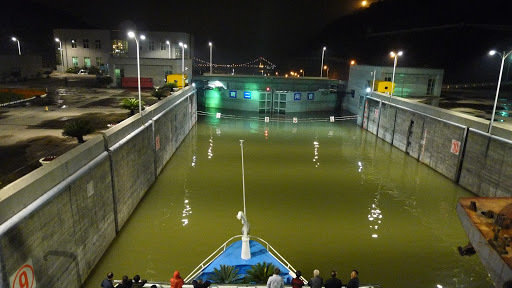 That green bit on the left is the balcony of the upper deck of our ship. All those people at the front (bow?) of our ship, waiting waiting. 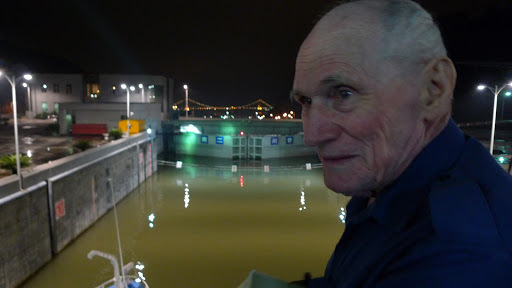 Sam chose to stay up late to watch the lock traverse. Here goes. Hey that looks like our Story Bridge in the distance! Honestly, I really don’t think bathrobes and slippers are appropriate attire for midnight lock crossings. This looks like the back of our ship looking backwards. Opening…. that guy down there looks excited. Hang on, that’s not Dave is it? 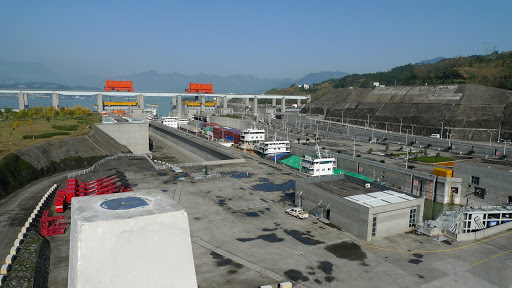 Now that the excitement of the lock crossings was over we came to the end part of the river cruise, and the eagerly anticipated tour of the 3 Gorges Dam itself. Sam was particularly interested in this Survey Marker. 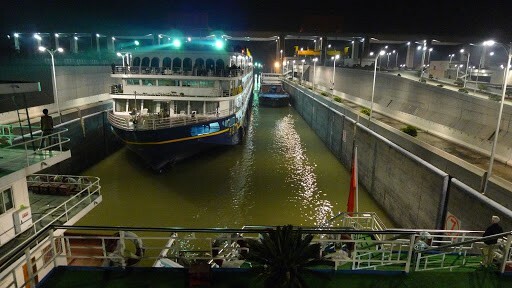 When we arrived by bus at the dam entrance, we were able to make it up to the incredible height of the dam & lock walls by lots and lots of connecting outdoor escalators. Jing told us that only 3 months ago she was there and they had to walk up over 500 steep steps to reach the top. So luxury for us. Dave & Sam enjoyed visiting the dam site, and I was interested for only about the first 10 minutes, then just wandered around waiting the 2 hours for the tour to finish. What really made the whole thing uncomfortable were the large groups of Chinese tourists descending on the site, with their incredibly noisy Chinese tour guides screeching into their loud-hailers. Seriously, they were worse than the groups on the Ghost Island, if that’s at all possible. 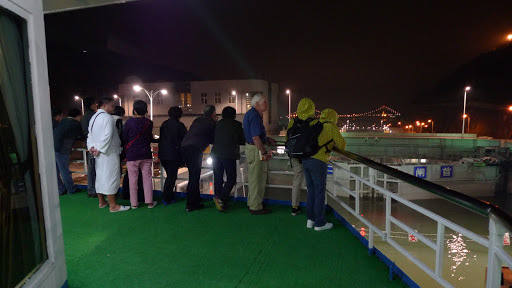 What is it about group tours that they feel the need to deafen anyone within 100 meters? 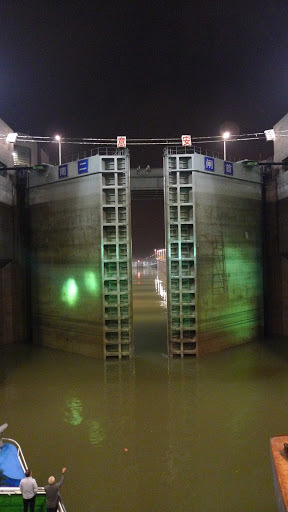 This is the last part of the lock system going downstream and you can see vessels lining up to go through. 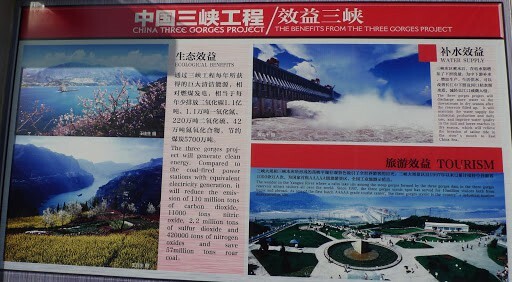 There are three hydro-electric stations embedded within the dam wall (one of them in the hill in the background) and these, we were told, supply one third of China’s power needs. Anyway, I did enjoy the landscaping and the way the market stalls were set up. Also, they had eco-toilets which I found very interesting (as I do have a fascination for checking out the ladies’ rooms wherever I go). 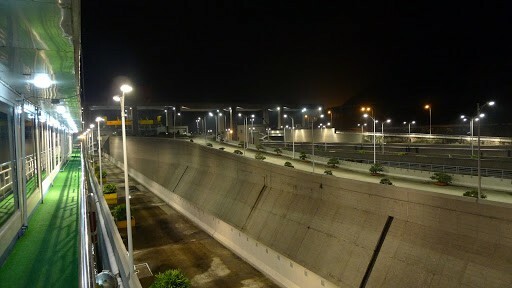 The upstream part of the lock system. 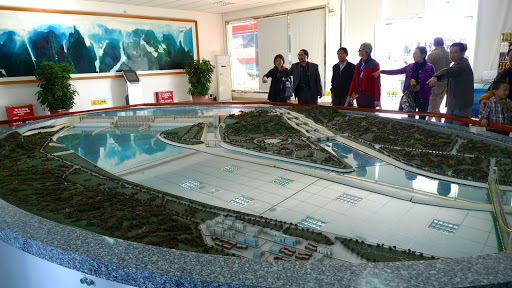 A model of the whole dam and lock system. 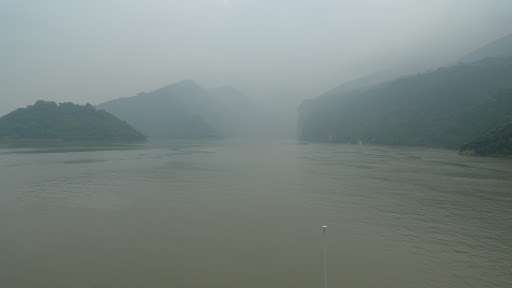 To wrap up the Yangtze River cruise part of our Intrepid Grand China adventure, I have to say that I really did enjoy the cruise. The boat was reasonably well appointed and very comfortable. The buffet meals provided excellent food every time. The people running the show seemed to know what they were doing and the staff were extremely friendly and accommodating. Our traveling companions, the mixed dozen, made great use of the down time opportunities to connect and hang out together. It’s just such a shame the air pollution spoils what would be absolutely stunning scenery. I can’t imagine how this will ever change because the cities along the river have populations of millions of people, and that’s where all our “made in China” goods come from. We really are part of the problem. I actually found it very confronting when witnessing the reality that over here in Australia, we contribute so heavily to the Earth’s pollution disasters by supporting these damaging industries. Yet these factories provide employment and sustenance to many many families….. tricky. We’re now about to make a move towards Shanghai for a couple of days. I’ve really been looking forward to seeing Shanghai. We know several people who’ve stayed for extended periods in Shanghai and they’ve given bits and pieces of advice and tips on getting around the place. This will be our second internal China flight and now that we know the planes are actually made of the same stuff as our own (not held together with band-aids and rubber bands), and that there are real pilots and flight attendants, we feel a bit comfortable about it. Hopefully I can have another update in a few days, so please come back soon to check out Shanghai and beyond.